While I liked the Chromebook, I eventually moved onto other things like the gadget nerd that I am (Before now, some here might not realize it, but that DOES include non-Apple products). However, my original Chromebook from Samsung that I bought back in 2012 is still going strong for my Dad. He was fed up with Windows and how each laptop he bought would get progressively slower and more trouble to use. He has been using this Chromebook, an iPhone, and an iPad Mini for close to five years now, and is a lot happier as a result. That six year old Chromebook is as fast and easy to use today as it was then. Other than a few cracks or nicks in the plastic case and battery wear, it still works just the same. That’s part of the beauty of an OS based in a browser. Even though it’s been a while since I have used one regularly, I have always kept up with the platform and devices that come and go. I definitely took notice of the reviews of Google’s new Pixelbook, which is by far and away the most premium Chrome OS device made to date, when it was released last October. While the price tag, which starts at $999, is absolutely insane, the design slowly drew me in. While the reviews and tech press coverage got my attention, I decided to actually try out and review a Pixelbook after seeing one on display at my local BestBuy. I came away more impressed after putting my hands on one and feeling just how thin and light it is in actual use. I was also impressed with the touchscreen, which I didn’t expect. I had an Acre Chromebook that was one of the first with a touchscreen, and it was virtually useless. This one really works well and actually adds to the Chrome OS experience. Google also has a Pen designed to work with it that demoed well in-store. I was supposed to get one with my purchase, but my salesperson at the BestBuy location I purchased at dropped the ball. I thought it was going to be in the box, so I didn’t notice until it was too late. I was told I can get one from another location, even if they have to order one, so I will report on that when I can. 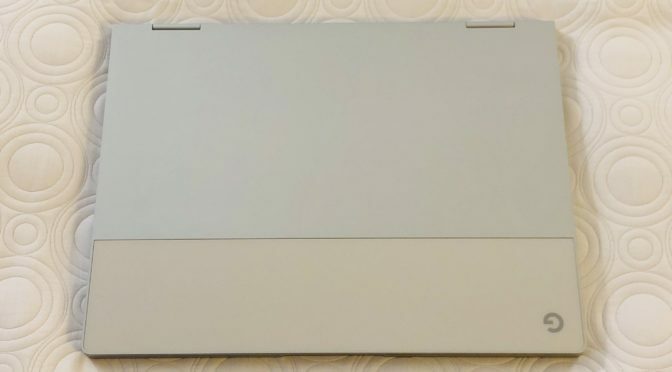 As for my initial impressions, the Pixelbook is exeptionally thin and light, and this is coming from someone who has been using Lenovo Yogas for almost four years. Those are ultrabooks by definition and aren’t exactly tanks, but the Pixelbook still puts them to shame. It feels as crazy thin and light as a current-gen MacBook, which is impressive in its own right. The body is part aluminum, part soft-touch plastic and soft padding in just the right proportions. It has the aforementioned responsive touchscreen with a versatile hinge design that allows use as a tablet, if you choose. The touchpad is accurate and consistent. The keyboard has good feel, adequate key spacing, and crisp feedback. The overall look and feel are simple and professional, which is good to see from Google. I’ve often been critical of them for how lacking and, frankly speaking, lazy their hardware efforts have often been in terms fit, finish and details. Unfortunately, the Pixel 2 phones were yet another example of this. However, this is FAR from the case with the Pixelbook. It is as close to a perfect touchscreen laptop design as I have seen. There is a reason why several tech writers called Apple out for their constant refusal to release a thin, light touchscreen Mac laptop after the releases of both the Pixelbook and the Surface Laptop. Apple’s Macs are still selling in high, and actually growing numbers, so it isn’t as if they are driving customers away with their designs. However, they have gone from being the darling of the tech media and vocal pro users, thanks to the groundbreaking MacBook Air and the powerful MacBook Pro, to falling behind some others in several respects. Apple may still be making hardware that most users are fine with, but they aren’t making what a lot of very vocal tech influencers want anymore. Combine that with the higher prices that Apple usually charges, and you have a lot of formerly loyal users who are in the public eye (at least in the tech bubble that people like myself pay attention to) changing desktop platforms and being very open and critical of Apple about why. While using the Pixelbook doesn’t make me question using Apple products (disclaimer- I am a lifetime Windows user, so I have no personally loyalty to Apple in desktop computing), I do understand the sentiments of some, because it shows the kind of design and build chops that we used to associate exclusively with Apple. So why am I using and writing about the Pixelbook? One reason is to see how close it can come to what I do on my iPad Pro. Both have really good touchscreens with a compatible stylus. Since I keep my iPad Pro in a keyboard case, both have quality attached keyboards that are backlit. Both are instant on devices that are easy to run and keep up to date, and as far as I can tell so far, both have great battery life. This should make for an interesting comparison as I switch back and forth over the coming days. That has already started, as I have written this entire article using the Pixelbook without issue. Normally I would us my iPad Pro for that task. Another reason I am doing this is because I think the Pixelbook drives home the point that I really would buy and use the iPad Pro in a MacBook body hybrid device that I proposed earlier this week. Neither my iPad Pro with a keyboard case, which adds extra bulk and weight, or the current MacBook, which lacks a touchscreen, come close enough to that device to give me an idea of what it would be like to use it. Ironically, Google’s Pixelbook is as close as you will get to that on the market right now. That’s why I have one, and that’s why I am going to be logging some thoughts on it over the next few weeks. Have you ever owed a Chromebook? How about a Chromebook Pixel? If so, what do you (or did you) think of the experience? Love it or hate it, I am interested to know. Also, no matter if you have used one or not, what do you think of Google’s new Pixelbook? How does it stack up to the iPad Pro or MacBook, in your opinion? Let me know in the Comments section below, on Flipboard, on our Facebook page, or on Twitter @iPadInsightBlog.